As a result of constant vandalism at the Memorial, the Commonwealth War Graves Commission has had to arrange for it to be regularly patrolled and public access limited to the period from 08.30 to 17.00. Should for any reason the Memorial be closed during the stated hours, please telephone the Guard Room at Brompton Barracks on 01634 822442 who will arrange for the gates to be opened. Any inconvenience to visitors is greatly regretted. The Memorial overlooks the town of Chatham and is approached by a steep path from the Town Hall Gardens. A copy of the Memorial Register is kept in the Naval Chapel of Brompton Garrison Church and may be consulted there. The keys to the church are held at the Gate House, which is always manned. Copies of the Memorial Register may also be consulted at: Chatham Library - Tel: 01634 337799 and Medway Archives & Local Studies Centre - Tel: 01634 332714 After the First World War, an appropriate way had to be found of commemorating those members of the Royal Navy who had no known grave, the majority of deaths having occurred at sea where no permanent memorial could be provided. An Admiralty committee recommended that the three manning ports in Great Britain - Chatham, Plymouth and Portsmouth - should each have an identical memorial of unmistakable naval form, an obelisk, which would serve as a leading mark for shipping. The memorials were designed by Sir Robert Lorimer, who had already carried out a considerable amount of work for the Commission, with sculpture by Henry Poole. After the Second World War it was decided that the naval memorials should be extended to provide space for commemorating the naval dead without graves of that war, but since the three sites were dissimilar, a different architectural treatment was required for each. 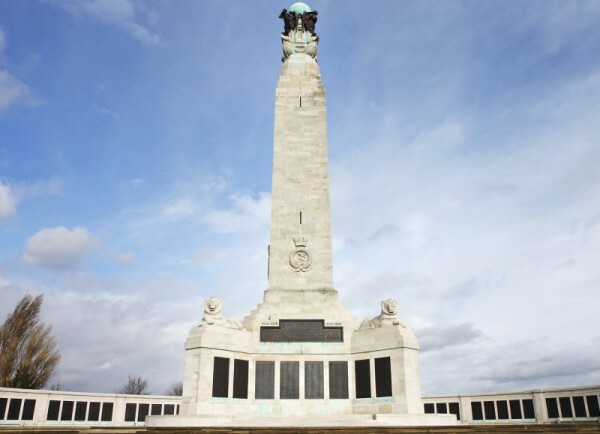 The architect for the Second World War extension at Chatham was Sir Edward Maufe (who also designed the Air Forces memorial at Runnymede) and the additional sculpture was by Charles Wheeler and William McMillan. Chatham Naval Memorial commemorates more than 8,500 sailors of the First World War and over 10,000 from the Second World War. There are 37 names of servicemen lost with HMS Glorious, HMS Ardent and HMS Acasta commemorated at the Chatham Naval Memorial.